Midstream beat the broad equity market and utilities. Oil prices were strong most of the week, breaking through $60/bbl briefly Thursday. 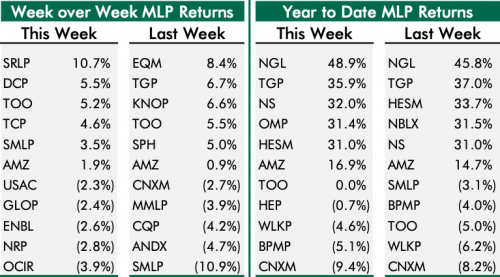 SRLP led all MLPs this week, as apparently there is renewed faith in the current 14.9% yield. Canadian midstream traded in a tight range as usual, with the exception of Keyera, which dropped 2.8% Friday and was well off the pace of the rest of the group on no news this week. The broad market crapped out Friday after rallying Thursday on perceived Fed support, but midstream outperformed on the day and the week. Oil price strength, a 15 bps drop in the US 10-year rate, and another positive private equity data point supported midstream this week. MLPs made up some ground on the broad midstream index (AMNA), which was dragged down by weaker Canadian stocks, but U.S. corporations and the AMUS kept pace. Midstream beat the broad equity market and utilities. Oil prices were strong most of the week, breaking through $60/bbl briefly Thursday. As such, I don't have quite as many clever things to say in the weekly post. 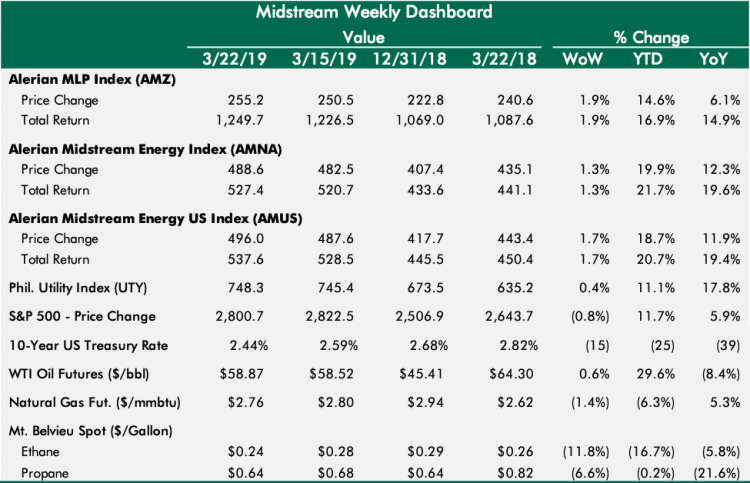 The next week will determine how we finish March, but midstream appears to be gaining the market's confidence with each passing week, setting up the potential for the sector to act more defensively on the margin if the market struggles to find its footing in the near-term. SRLP led all MLPs this week, as apparently there is renewed faith in the current 14.9% yield. No real news among any of the other top performers. In the bottom 5, ENBL was under pressure due to the block trade Thursday night that cleared out ArcLight. TOO repeated in the top 5, SMLP rebounded from its last place spot a week ago. On the YTD leaderboard, OMP replaces NBLX in the top 5. 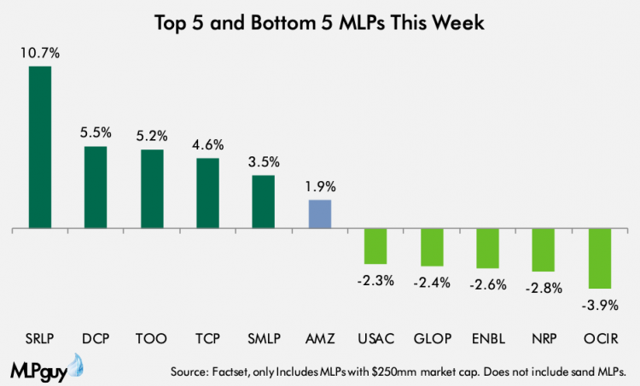 Each of the top 5 is up 30%+ and only 4 MLPs are negative for the year. HEP replaced SMLP in the bottom 5. 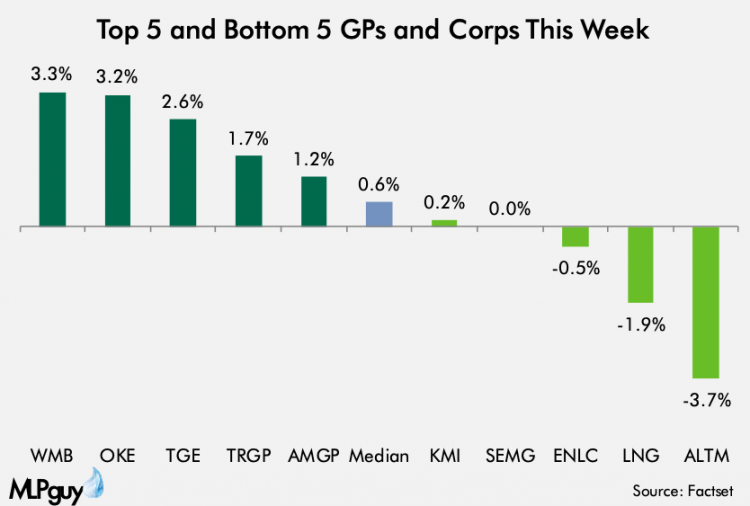 WMB's latest joint venture and de-leveraging efforts was well-received by the market, and WMB led all US corps this week. 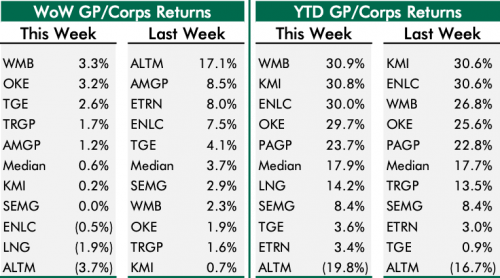 KMI was notable underperformer for a second week in a row. Profit taking and analyst downgrades likely to blame there. TGE and AMGP (or AM now that the deal has closed) both repeated among the top 5. On the YTD leaderboard, WMB took over the overall lead from KMI. ENLC joins those two with 30%+ returns YTD. Only one midstream corporation is negative for the year (ALTM), and Cheniere (NYSEMKT:LNG) is in the bottom 5 with a 14% return. Canadian midstream traded in a tight range as usual, with the exception of Keyera (OTC:KEYUF), which dropped 2.8% Friday and was well off the pace of the rest of the group on no news this week. Canada in general created its own positive news when Alberta announced a relaxing of production limits over the next two months. On average, Canada underperformed U.S. midstream this week. 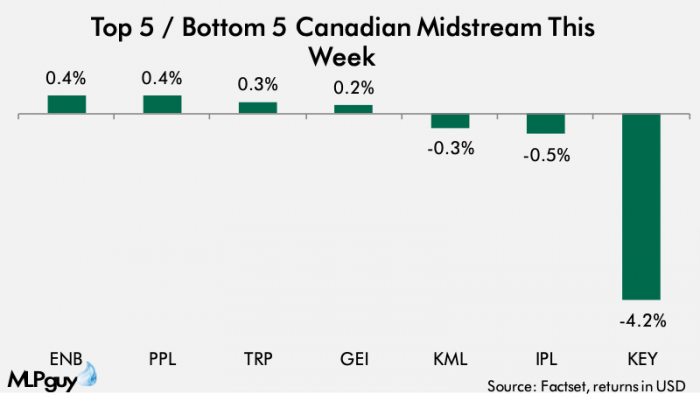 TRP took over the top spot in Canada this week, and ENB closed the week with a 20%+ return for the year, making it 5 Canadian midstream companies out of 7 with 20%+ returns YTD. For a second straight week, we have $1bn+ M&A in the Marcellus. This time it was WMB consolidating partially-owned assets and bringing in one of the biggest and most experienced infrastructure investors in North America at an attractive multiple. Positive data point for the public vs. private valuation gap theme.